Always insist on a quality inspection every time! 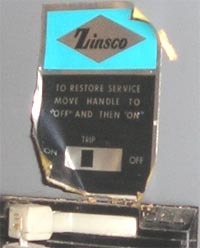 If you have a Zinsco or Federal Pacific panel, please have it checked by an Electrician. The sellers of the house with this Zinsco panel had painted the outside with fresh silver paint. This was a red flag, we knew before we opened it there had to be a major problem. This panel has been arcing at the bus bars. 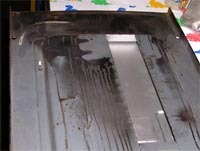 This is one of the most hazardous panels we have inspected yet! Note the extensive soot inside this panel and inside the cover, this is a sure sign of overheating and is an extreme hazard. These sellers were attempting to hide the fact that this panel had major problems. Always insist on a careful check or this critical component when ever you buy a home. There can be real potential safety risks in the home, and real estate is the biggest investment most people make in their lives. Can you afford to buy without an inspection? We did an inspection of a condominium in for Cheryl N of Redmond WA. When we checked the electrical we saw several problems. Zinsco electrical panel - see safety information on panel at www.hipspro.com. 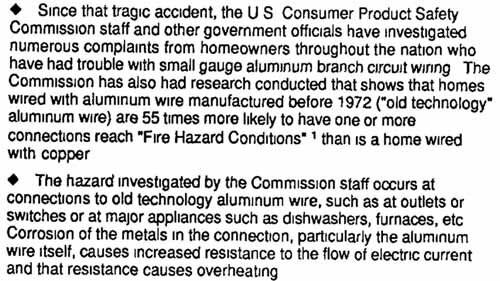 Aluminum branch circuit wiring - more information at Consumer Product Safety commission. Crack on main feed lug holder to panel. Possibly was over tightened. Missing smoke detector in bedroom. We also verbally recommended replacement of the Zinsco panel and repair the aluminum wiring and noted it further in her report. See Cheryl's actual electrical detail report page here. We got a call 35 days after that inspection, the recommended repairs didn't get addressed immediately. She had an electrical fire in an outlet. Fortunately, she was forewarned and was alert to the potential hazard. She immediately recognized a dangerous situation and called the fire department. Luckily she was home and awake at the time of the fire and the damage was limited to the outlet or this could have been very serious. She worked with a reputable electrician we recommend. JJ has known the guys at C&R Electric for almost 40 years. 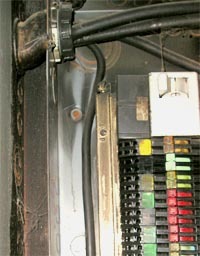 When their electrician first got to work on this job, the breaker box was malfunctioning to the point of heating up the case. The components inside must have been very hot to make the whole enclosure so warm. He diagnosed the problem to be an overloaded circuit which caused the outlet to catch fire. Electrical current had exceeded the capacity of the outlet and a faulty Zinsco panel never turned off the power. It is our opinion, when you take into account both the aluminum wiring and the Zinsco panel, there is a significant hazard. This combined with the risk multiplier of a condominium with many units likely wired the same way causes our greatest concern. We hope this moves the homeowners association to investigate and repair this condition in all the units.